Annual State Dep. report shows department urged Israel to curtail Jewish prayer on Temple Mount, agree to Reform demands at Western Wall. The annual State Department report on religious freedoms emphasizes US efforts to maintain limitations on Jewish visitors to the Temple Mount, including restrictions preventing them from praying at the holy site. In the report released Thursday, the Israel section reflects the importance that the State Department attached to tamping down tensions that exploded in July after terrorists killed two Israeli policemen on the Temple Mount. The report makes specific reference to attempts by members of the Reform movement to conduct prayer services at the Western Wall, which abuts the Temple Mount. The section on the Temple Mount, the holiest site in Judaism, is unusually lengthy and documents in detail what appear to be official Israeli actions challenging the status quo of limitations on Jewish visitors. The “status quo” refers to agreements whereby the Waqf, the Muslim religious authority that answers to Jordan, holds religious authority on the Temple Mount itself. For decades the Waqf has banned Jewish worship on the plateau — in agreement with successive Israeli governments — while allowing Jewish visitors. 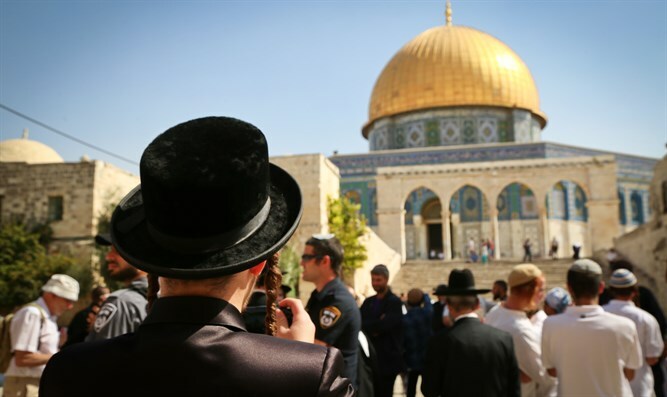 “Despite the Israeli government’s policy prohibiting non-Muslim worship at the site, some Jewish groups escorted by Israeli police at the Haram al-Sharif/Temple Mount performed religious acts such as prayers and prostration,” the report said. Also addressed at length is the ongoing dispute between the Israeli government and the Reform movement, which has demanded Israel expand a prayer space at the Western Wall allotted for non-traditional ceremonies, and grant partial control over the space to non-Orthodox organizations. “The Israeli government did not implement a cabinet agreement reached in January to establish a Reform, Conservative, and mixed gender prayer platform along a separate portion of the Western Wall,” the report said. Friedman’s efforts to promote interfaith understanding received multiple mentions in the State Department report. “Embassy-hosted events, including an interfaith Ramadan iftar and an interfaith Thanksgiving dinner, promoted the reduction of tensions between religious communities and an increase in interreligious communication and partnership within society by bringing together representatives of many faith communities to advance shared goals and exchange knowledge and experience,” the report said. The report refers to Judea, Samaria, and eastern Jerusalem as “occupied.” Friedman was reported in recent weeks to have urged the State Department to drop the term, although the State Department has described the reports as “misleading” without explaining why. One feature of the report was to include terrorist attacks by Islamist groups as possible violations of religious freedoms. “Because religion and ethnicity were often closely linked, it was difficult to categorize much of this violence as being solely based on religious identity,” the report said by way of explanation. In releasing the overall report, Secretary of State Rex Tillerson and his department emphasized countries that have “systematic, ongoing, and egregious violations of religious freedom.” These included Pakistan, Burma, China, Eritrea, Iran, North Korea, Sudan, Saudi Arabia, Tajikistan, Turkmenistan and Uzbekistan. Saudi Arabia was a notable entry: One of the Trump administration’s success stories has been the vast improvement of U.S.-Saudi relations, as opposed to tensions between the Saudis and the Obama administration.